Nearly every individual requires legal advice at some point in his or her lifetime. Whether it is getting your paperwork in order or you have a major Bankruptcy case, when it comes to matters of law, the firm that you choose to represent you makes all of the difference. The Ficara Law Office located in Yucca Valley comes highly recommended as one of the top personal and financial legal assistance firms in the district. Their highly trained and knowledgeable staff can help assist you in your legal proceedings. They gladly explain and clarify all of the information so you clearly understand exactly what it is you are signing. The dedicated individuals working for the Ficara Law Office are dedicated to what they do and will always provide top service and value for the people that they serve. 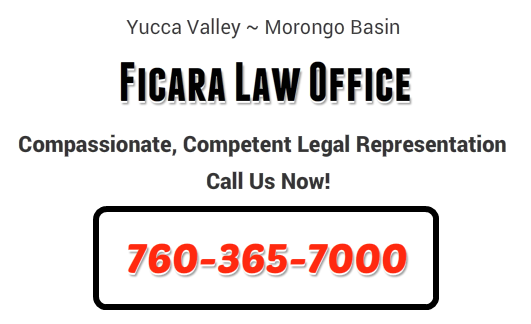 If you are a resident of the Morongo Basin or the Coachella Valley who is processing important legal documents, are in need of advice, or have found yourself in a bind, do not hesitate to call the Ficara Law Office. With their expert assistance you can very quickly have your financial and personal legal issues taken care of. No longer must you worry about finding a law firm you can trust with your confidential information. The Ficara Law Office helps to simplify the legal process and gets things done properly, effectively, and with little to no additional stress. What sets the Ficara Law Office apart is their no-hassle dedicated service promise. If you do not understand something about your legal proceeding, Ignazio Ficara will gladly sit down with you and explain things in layman’s terms so that you understand completely. Ensuring that his clients feel confident in the final outcome of their case is extremely important to the Ficara Law Office Team. This is why they are always willing to go the extra mile to guarantee a satisfactory outcome. At the Ficara Law Office, we approach the complex legal needs of our clients from a very personalized and results-driven perspective. Our clients demand the best representation of their important financial and personal legal matters, and we respond by consistently delivering the highest quality legal services. If you have a pressing legal issue that must be dealt with, call (760) 365-7000 to make an appointment with the Ficara Law Office. We can handle a wide range of legal matters effectively. We are committed to interacting with each client in an honest manner. We have a strong work ethic and take a client-centered approach. We provide strong legal counsel and guidance while being caring and understanding. We proudly serve Yucca Valley and the Morongo Basin. You’re searching the Internet right now looking for help and you need answers, you need the Ficara Law Office – Call Us Now!